I'm very pleased to announce a new partnership between North Star Military Figures and Copplestone Castings. I've been friends both personally and professionally with Mark Copplestone for the past decade, and so I'm delighted that we're working closer with this new arrangement. From now, all production, sales and orders will be handled by North Star in Nottingham. This'll free Mark to concentrate on new packs for Copplestone Castings, and start work on some new projects he's been wanting to do. This is the new website: copplestonecastings.co.uk. To celebrate this new deal, I've discounted all the Copplestone Castings packs for the next week. Mark has contributed to this launch with a new special-edition figure, available free to customers who spend over £25 GBP on Copplestone Castings. The figure is of a Post-Apocalypse Road Warrior (28mm-sized metal figure). The Road Warrior will be available through March and April. Limited to one per customer. 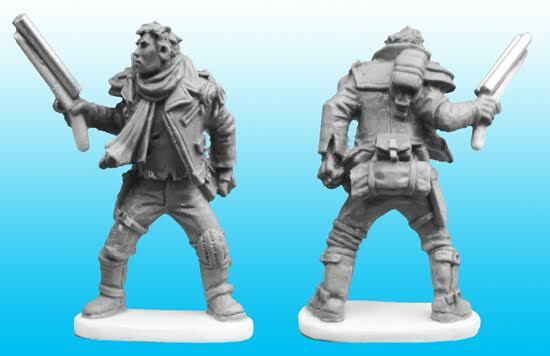 The next releases from Copplestone Castings will be additions to the 15mm Barbarica fantasy range. To keep up-to-date with Copplestone Castings new releases, sign up to our joint newsletter. Mark himself will be contributing to the newsletters, so if you're a fan of his, he'll still be in touch. You can read our last newsletter here. If you use social media, we keep our Facebook and our Twitter sites up-to-date with news as it happens.